We made this card last week at our Stamp-a-Stack. The girls loved it and the funny thing is that I added this card at the last minute. 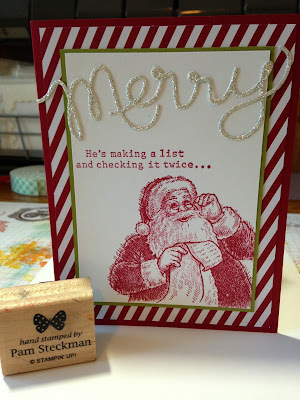 The candy cane striped paper is called Seasons of Style Designer Series Paper and I love it! Do you love that Santa as much as me? It's from the "Santa's List" stamp set. I have a lot of Christmas cards and projects coming your way but tomorrow I have a great fall project for you! Come back and check out what I have in store for you! Thanks and see you then! I so LOVE this Santa! I've been using him so much this year making cute cards. Your card is just perfect for him. I may CASE it and use the silver foil paper as I think I'm out of the silver glimmer.